These Viral Posts Show Paid Sick Leave Is a Big Issue in the U.S. When it comes to sick days for workers, employers in the U.S. are divided. And I don’t mean divided in that cute little “cross your arms and lean back-to-back with a cheesy look of exasperation as you pose on the cover of a bad ‘90s tween movie” type of way. No, this divide is deep and wide. While the issue has come up over and over in the media recently, the polarizing attitudes have never been more apparent than they were this past week when two separate stories landed on our radar. They showed just how drastically different the viewpoints seem to be. First, we stumbled across a story from ATTN: about six Jimmy John’s employees in the Twin Cities area who were fired for creating a meme that called out the franchise owner for not offering paid sick days. After the incident, the employees took the case to court. The U.S. Court of Appeals for the 8th Circuit ruled last week that the franchise owner was within his rights and that the six workers were “so disloyal” to the company that they would be forced to forfeit their legal protections. This was a reversal of a ruling made by the same court in 2016 that said the six workers should be rehired and given back pay. Well, after we passed that article around the office to a chorus of “Ick” and “Seriously? !” and “Boy, we are so glad we work for a company that has a flexible sick leave policy,” we came across another story from ATTN: — and it garnered an office-wide slow-clap (a figurative one, but still). The next day, she received a response from the company’s CEO, Ben Congleton, thanking her for bringing attention to the practice of using sick days for mental health. In his reply, Congleton said that emails like the one Parker wrote “help cut through the stigma.” He also expressed his disbelief that using sick days for mental health wasn’t a standard practice in the workplace. Parker tweeted a screenshot of the email exchange, and it has since received more than 40,000 likes and nearly 14,000 retweets. Congleton was shocked at the attention that the tweet received, and wrote an article explaining why recognizing mental health in the workplace is so important. While these two stories illustrate opposite ends of the spectrum, they help shine a spotlight on the way we as a society treat mental health in the workplace. The Jimmy John’s situation is obviously maddening — I mean, who wants a sneezy sandwich artist slapping infected cheese onto viral ham before serving it to you with a side of kettle-cooked germs? Yeah, Imma take a hard pass on that one. But what if Parker had been fired instead of supported by her boss? Would people have been angry about it? 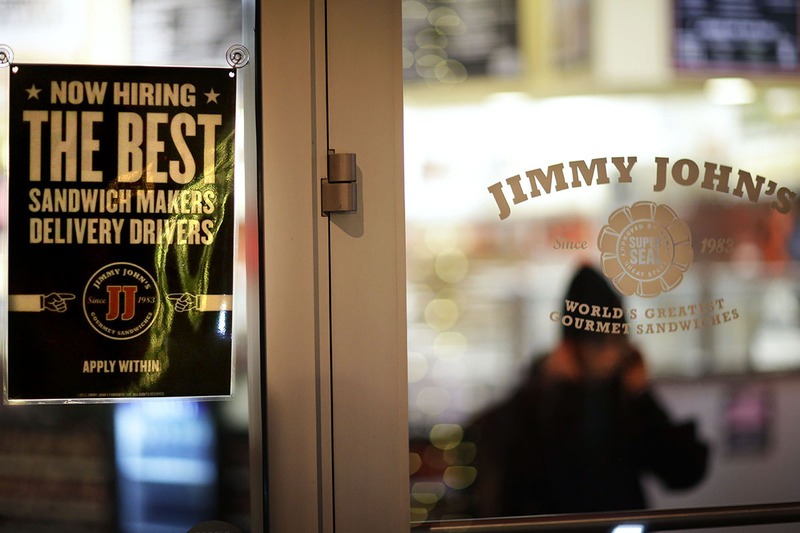 Would an uproar the size of the Jimmy John’s response have ensued? Or would it have been talked about in a way that only served to further stigmatize mental health issues? It’s time for us to start viewing mental health in the workplace the same way we view physical health. I don’t mean the Jimmy John’s way, of course — I mean in a way that reduces the stigma and gives people the freedom to both talk about and care for their own mental health in the way they see fit. In the U.S., about one in five adults suffers from some form of mental illness. Yep. Look around your office — can you spot five of your friends? Chances are, one of them had a bad day yesterday, or last week, or last month. Or maybe it’s you, and you’re struggling through another day because you feel like you have to hide the status of your health from your coworkers and your boss. Would you do that if you had the flu? We, as a society, need to start treating mental health as carefully as we treat physical health — if any part of your body (brain included) is not functioning at 100%, you won’t be able to devote 100% of your efforts to your work. So what can you do if your mental health is impeding your ability to do your job as well as you know you can? Recognize when you may need to take a mental health break. Are you disengaged? Not getting enough sleep? Are you struggling to put your best work into a project because you’re just not all there? There are no definitive, one-size-fits-all criteria here — so don’t let anyone but you determine when you’re in need of a break. Don’t be afraid to talk to your boss about the state of your mental health. If you’re unsure of how to talk about it, here are some tips that can help you prepare for the conversation. Take care of yourself. I know, this one is easier said than done. But when you take that mental health day, be sure to take care of your body, brain and well-being. Do things you love: spend an hour outside, listen to music, learn a new skill, eat your favorite foods, read a book, vacuum your rugs, play with your dog, re-balance your budget, catch up with friends — whatever it is that makes you feel good. There’s no right way to spend your mental health day, but make sure that you’re taking an active approach — not a passive one. Identify your needs and then fulfill them. Destigmatize mental issues by talking openly about mental health. This one falls on both employers and employees — all of us, really. We should be striving to create a culture of acceptance and normalization by talking as openly about mental health as we do about physical health. Unfortunately, though, too many people are left without the option of taking a sick day of any sort. As we continue working toward a place of understanding and acceptance when it comes to health and the workplace, we will hopefully see changes in the way we as a society treat sick time and our health in general. Currently, businesses in seven states and Washington D.C. are legally required to offer employees paid sick leave. Hopefully, this type of legislature will continue to be instated until everybody has the ability to take the time to care for themselves without fearing the consequences.